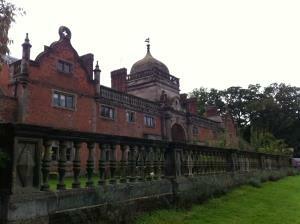 Ingestre Lodges is in the beautiful Conservation area which lies three miles to the east of Stafford. Ingestre has excellent road and rail links to the rest of Great Britain. The M6 motorway gives easy access to the North, South-east and South-west of England. Birmingham and Manchester airports are within an hour’s travelling time. Stafford railway station lies on the West Coast main line, 100 minutes from London Euston. Follow brown signs to ‘Ingestre Stables’ which can be found on the outskirts of roads out of Stafford on the Weston Road junction, or along the Tixall Road from either Stafford or Great Haywood. Turn off the Tixall Road following signs for Ingestre and Golf Club,Stables, Church and Hall and drive along the lane for 3 minutes passing the Lion Lodges gatehouses on your immediate left and continuing on past the Ingestre Park Golf Club. Follow signs to Stables, Church, Hall at the bend of the road and up a slight slope towards the New Stables building which is also the home to Ingestre Stables. The property is a grand Victorian building with grass verges and balustrades. Please see our website of what the property looks like at ingestrelodges.com and on the front of the Home page. It is on the left and further up the hill is the Old Stables, the Church and Ingestre Hall which is up the slope just out of sight. A row of balustrades fronts the road and in front of you there is a large archway with rampant stone lions and a coat of arms and large wrought iron gates. Once through the gates turn left and drive to the left of the courtyard grass circle. You will see a range of buildings with an approach of standard roses and a couple of lollipop box trees. There is signage that says ‘Ingestre Lodges parking reserved for Guests only’. Park anywhere in the gravelled areas along side the building. 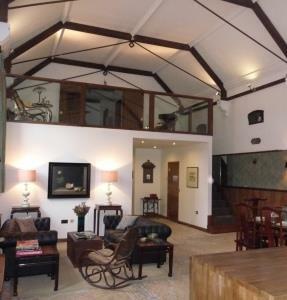 In Chetwynd which sleeps 8 people we provide 3 downstairs bedrooms for disabled access. One of the bedrooms has a wider door and wider door to the shower room. The shower room has a large shower with a seat inside. We also provide a separate disable WC on level access, in the central part of the property below Diamond Lodge. This has handrails, low sink to conform to the standards, an alarm to call for help with a flashing external light. This is accessible from ground level and level access.